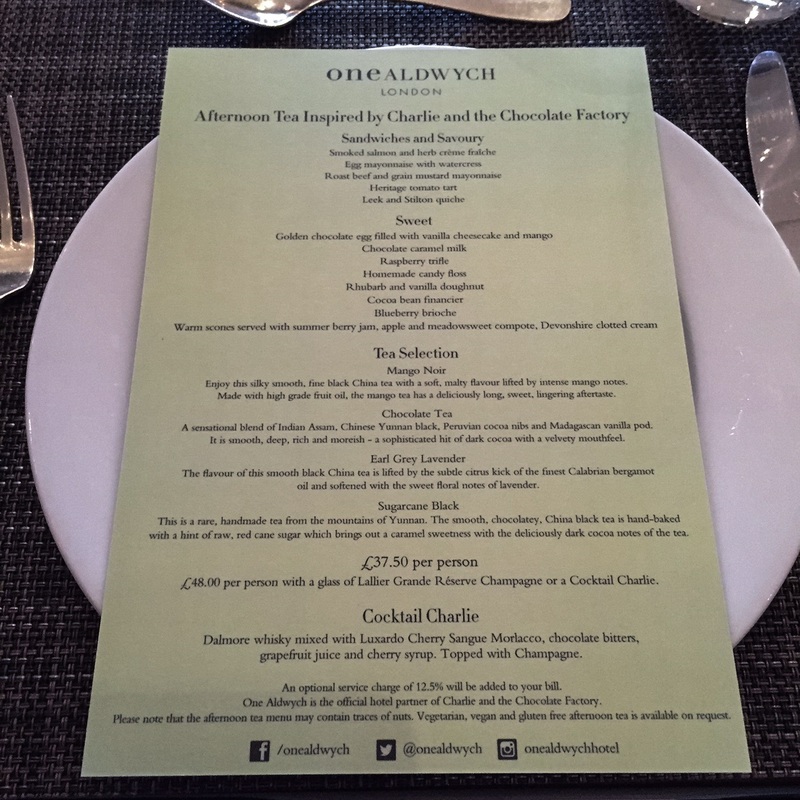 If, like me, you’re an absolute sucker for an Afternoon Tea then I have to tell you about the Charlie and the Chocolate Factory inspired tea at One Aldwych, London. I’ve been to various Afternoon Teas over the years, however none have been quite so quirky as One Aldwych. 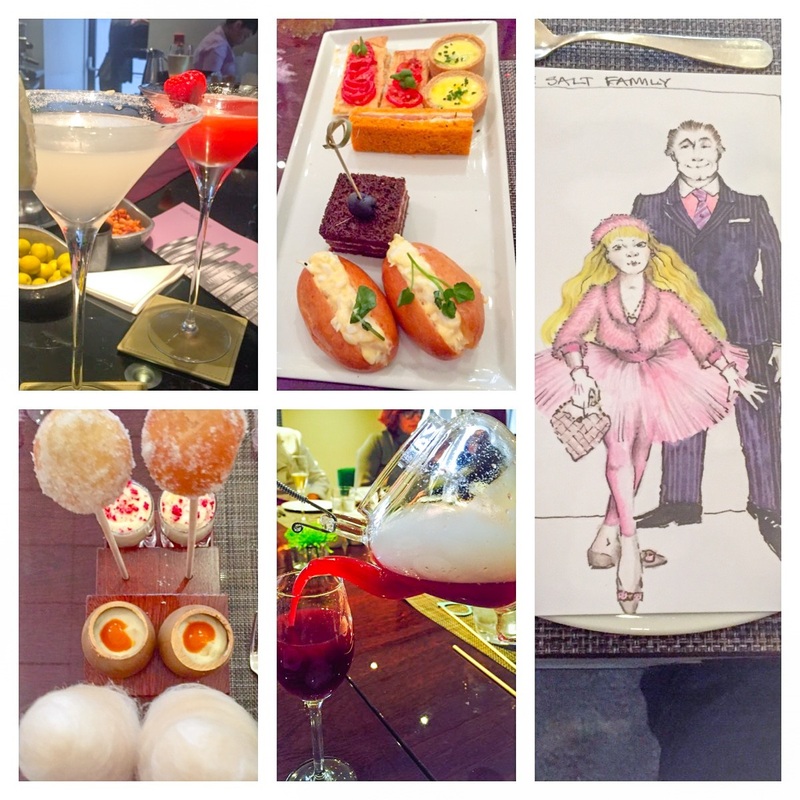 Every detail has been cleverly thought-out, even the menus have Charlie and the Chocolate Factory themed illustrations! It’s all very darling and extremely fun. The food was just gorgeous with everything you’d expect from an Afternoon Tea, smoked salmon sandwiches, egg mayonnaise rolls and an unusual looking roast beef sarnie not to mention some gorgeous savoury pastries. The real show stopper were the sweets and I have to say I LOVE a bit of sugar but there was so much! The homemade candy floss was scrumptious, definitely took me back to being a child at a funfair. I’m almost positive it was salted caramel which was a pleasant surprise however it was very sweet (I should have probably saved this to a little later on but I went for it all guns blazing and then was on a bit of a sugar high!). The golden chocolate filled eggs are great fun, such a good idea and utterly delicious. I washed this down with the chocolate caramel milk and by that time I was almost ready to burst (or go into sugar shock!). I had to skip the trifle and brioche’s (and scones…. *sobs*) just because I couldn’t physically fit anything else in! It just kept coming! The staff were very friendly and accommodating, there were quite a few of us as we went for my friends Hen Party so they put us in a Private Dining Room which I think is such a good idea when there are so many of you. Apart from my gluttonous behaviour and over indulging, I would most certainly recommend One Aldwych Afternoon Tea. It’s by far one of the best I’ve been to in London, purely for originality and you most certainly get your money’s worth. Here are some snaps… enjoy! Do you have any afternoon tea recommendations? I’d love to hear them.